Watch the European landscape from the comfort of your private suite. Europe: so far away, so much to do, and never enough time… so let Avalon Waterways take care of it for you. When planning a trip to this fascinating continent it’s hard to choose where to go and how to do it. Do you tick off the classic European destinations such as Paris, London and Rome or discover some of the lesser known cities and towns. Do you travel by train or plane? Do you join a bus tour? Do you hire a car? Or do you sit back and discover Europe from its rivers? River cruising through Europe is one of the most majestic ways to explore this great continent. You experience different countries, cultures, languages and cuisines with complete ease – no need to tackle a map, board a plane, or pack and unpack your suitcase (as clichéd as it is, it’s the true beauty of cruising). As you travel along the mighty waterways considered the lifeblood of Europe, your suite window provides the frame for an ever-changing and fascinating landscape – hillside vineyards, ancient gorges, medieval towns, historic windmills, crumbling castles, half-timbered houses and more. It’s magical, but it’s not always an option for all travellers to Europe… until now. Sit back and relax as you cruise to your next destination. 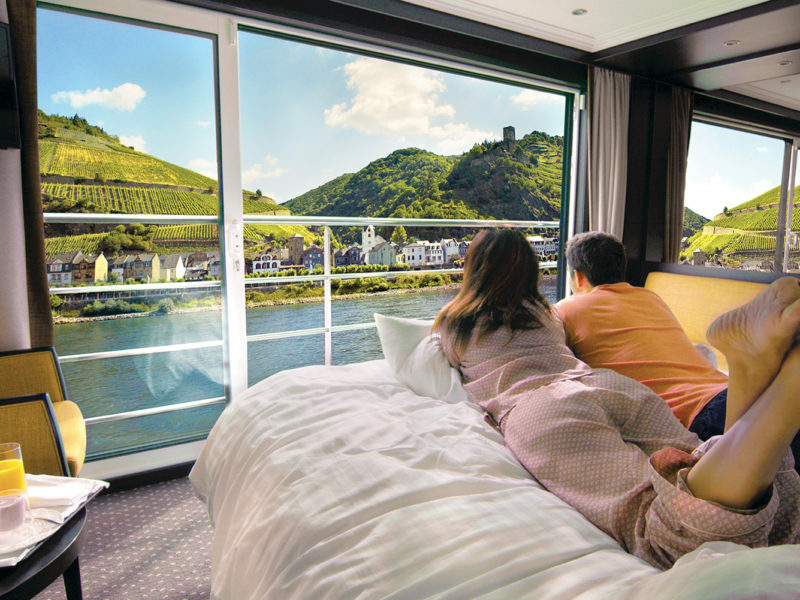 Travellers who want to add a cruising component to their European holiday but are time poor – or simply don’t want to spend a week or more on board a ship –will love Avalon Waterways’ new short cruise options for 2020. The luxury river cruise company is the first in Europe to offer ‘taster’ cruises of three, four and six nights, catering to those who want to see Europe from a different perspective in a shorter time, as well as first-time cruisers who want to, ahem, test the waters and learn what river cruising is all about. Despite being much shorter in length, Avalon Waterway’s new cruises still pack a punch when it comes to experiences. With many smaller towns and villages dotting Europe’s riverbanks and with most sailing done at night, there’s more time for sightseeing and less time spent getting from A to B – which, incidentally, is a delightfully scenic experience on board a river cruise anyway. So it’s a win-win all round. The serenity of cruising through Europe is second to none. In just four days, you can experience Europe’s second longest river, the Danube, cruising from Vienna to the brilliant Hungarian city of Budapest on A Taste of the Danube. You will sail through the picturesque Wachau Valley with the choice to bike through its vineyards, take a tour of an 11th-century Benedictine abbey in Melk, stop in the 18th-century town of Bratislava and walk its cobblestoned streets, and enjoy an on board performance by local Slovakian musicians. Take a stroll along the Danube in your final stop in Budapest. If you have five days, you can explore one of Europe’s most important rivers, the Rhine, on A Taste of the Rhine. Boarding in Amsterdam, you’ll visit the 2000-year-old city of Cologne, sample wine in the hilly town of Rudesheim, cruise through the picturesque Rhine Gorge, and choose to explore the Dutch countryside by bike. While the six-day Heart of Germany cruises on the lesser discovered Main River and Main-Danube Canal, with optional visits to the historic rally grounds used by the Third Reich at Nuremburg, the old Bavarian town of Rothenburg, and a walk through the medieval town of Bamberg. Experience the rich history and culture of quaint Bavarian towns. Life on board Avalon Waterways’ ships is all about the balance of luxury and comfort. The cruise company is known for its spacious Panorama Suites, which are 30 per cent larger than most standard river ship staterooms and designed so all beds face the wall-to-wall, floor-to-ceiling windows. These windows open up to create open-air balconies, the only ones of their kind on Europe’s rivers. And life on the river banks is filled with fascinating experiences from walking tours through historic towns, to active excursions such as cycling and hiking, to immersive experiences such as an art class or chocolate making, to indulgent pursuits such as sampling regional delicacies and wine tasting. Discover vineyards on one of many shore excursions. Even if you are travelling to Europe on a whirlwind, Avalon’s new taster cruises are the perfect addition to your holiday, allowing you to view this continent from a different perspective. And if you’re a first time cruiser, it’s the perfect way to discover the magic that is river cruising. Everything is included in your Avalon Waterways’ fare: all meals, which usually comprise of the regional cuisine you are travelling through and include local wine and beer at lunch and dinner, onboard activities and entertainment (such as wine appreciation, historic lectures and live music), land excursions led by local guides, as well as complimentary wi-fi, coffee and tea, L’Occitane bathroom products and access to the on board fitness centre and whirlpool.